1) Duke fades down the stretch. 2) This is due to the starters playing way too many minutes, causing them to get tired. 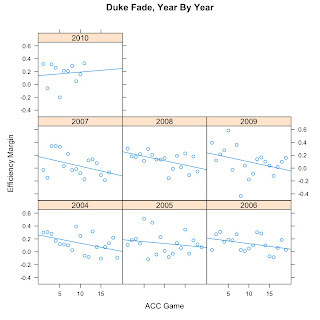 True, there is a downward trend most years, and Faranoff does mention that Duke's trend is technically upwards this season. Most seasons, that line is not significant: there is not enough evidence to say that the regression line differs from no slope. However, the null hypothesis can be rejected in 2004 (r-squared 0.2177, p = 0.04406) and 2008 (r-squared 0.2993, p = 0.01879). Here's my question: if a declining efficiency margin during ACC play is a bad thing, then why did the 2004 team make the Final Four, despite having one of of the few significant in-year declines? To summarize, there is still an overall significant downward trend in efficiency margin as the season progresses, although the significance is reduced. 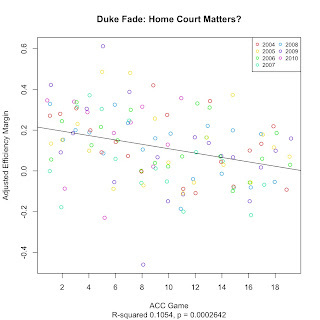 3) Home Court Matters? When Ken Pomeroy adjusts for home court, he adds 1.4% to the home team's offensive efficiency and visiting team's defensive efficiency, and subtracts the same from the home team's DE and visiting team's OE. So the difference between Faranoff's raw data and what Pomeroy would consider "adjusted" is -2.8 for Duke's home games and +2.8 for Duke's away games. What happens to the correlation if we make the "Pomeroy Adjustment"? The correlation coefficient decreases, as does the significance, but not to the point where the slope becomes non-significant. There is still a Duke Fade when we account for home and away games. I must say I come away unimpressed with other explanations for the Duke Fade. 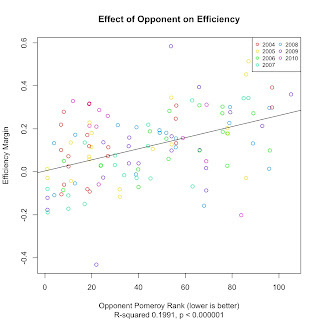 Opponents do get tougher but not enough to overcome the efficiency drop. Adjusting for home and away games also doesn't have much of an effect. It is very important to note that nowhere have I suggested a causal agent for the Duke Fade. This is to avoid the common fallacy that correlation implies causation. 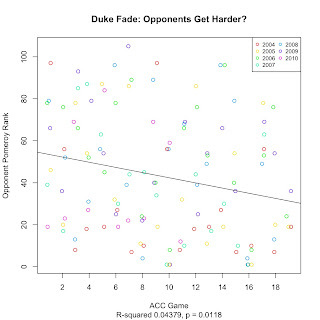 Clearly, Duke can still have an historic season (2004) despite having one of the few significant in-year Duke Fades. Instead, I'll take an "I Report, You Decide" kind of approach here. These are the statistical facts, and I'll be happy to attempt more rigorous investigations if they are suggested in the comments.